To estimate the prognostic impact of estrogen receptor (ER)-status among women with primary invasive breast cancer, according to age at diagnosis. We studied 1910 women with primary invasive breast cancer (stages I–III) who were treated at Women’s College Hospital between 1987 and 2000. For each patient, we obtained information on age at diagnosis, tumour size, lymph node status, ER-status, treatments received (radiotherapy, chemotherapy and tamoxifen) and dates and causes of death. Patients were followed from the date of diagnosis until the date of death from breast cancer or the date of last follow-up. We used the Kaplan–Meier method to estimate the 15-year actuarial rates of breast cancer-specific survival for women with ER-positive and ER-negative breast cancer, according to age at diagnosis (categories). We used the Cox proportional hazards model to estimate the adjusted hazard ratios for death from breast cancer associated with positive ER-status (compared to negative ER-status), stratified by age at diagnosis. We identified 1347 women with ER-positive breast cancer (70.5%) and 563 women with ER-negative breast cancer (29.5%). Among all 1910 women in the cohort, the actuarial rate of breast cancer-specific survival at 15 years was 77% for those with ER-positive breast cancer compared to 70% for those with ER-negative breast cancer (adjusted HR = 0.69; 95% CI 0.56–0.85; p = 0.0006). The prognostic impact of ER-status differed according to age at diagnosis. Among 213 women diagnosed before age 40, breast cancer-specific survival at 15 years was worse for those with ER-positive breast cancer than for those with ER-negative breast cancer (55 vs. 61%; adjusted HR = 0.90; 95% CI 0.57–1.41; p = 0.64). 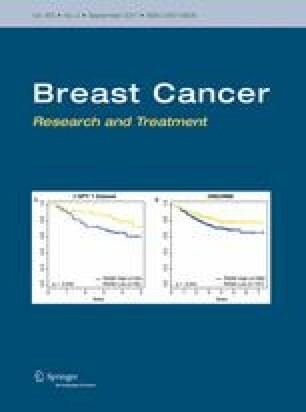 In contrast, among 1697 women diagnosed between ages 40 and 75, breast cancer-specific survival at 15 years was better for those with ER-positive breast cancer than for those with ER-negative breast cancer (78 vs. 72%; adjusted HR = 0.60; 95% CI 0.47–0.76; p < 0.0001). Positive ER-status is a favourable prognostic factor among women diagnosed with breast cancer at or above age 40, but not among women diagnosed before age 40.